We invite you to explore India - the Land with infinite beauty ! Whether you soar high into Himalayas or peer under the ruins of the Ancient monuments dotting the landscape of India, you will cherish the experience long after your visit ! This India Travel Guide on Kashi Vishwanath Temple is free from any commercial interest! This site is dedicated to promote India - the vast subcontinent, its glorious past, magnificent landscape and its infinite variety. The city of Varanasi or Kashi is found at the confluence of the rivers Varana and Asi with the mighty Ganges. The Ganga takes the shape of a bow in this area. The name Kashi owes its origin to the Kasha tribes who inhabited the surrounding land. The city of Varanasi finds mention in the Indian epics of Ramayana and Mahabharata. Kashi town has staked its claim as the oldest living city and cites ancient Sanskrit literature for its 3500 year history. The first Jyotirlinga is said to be burst out of the earth's crust here and flared towards heavens as Shiva manifested his supremacy. The famous Kashi Vishwanath Temple was built here and it remains intrinsic to Saivaitism. Hindus believe that a pilgrimage to Kashi Vishwanath Temple (where after the traditional puja, the pilgrim collects the water from the holy Ganges to be used in the puja in Rameshwaram Temple) is part of the Samskara - meaning sacraments observed by the Hindu from the birth to the funeral pyre (from Garbhadana - conception to Antyeshti - the last rites). If you want to quit the Samsara Bandha - the pursuit of worldly pleasure from a family bond - the starting point is Kashi. Lord Shiva - the all mighty will free one from the continuous cycle of births and deaths (reincarnation) and you can enter the Moksha (heaven) or attain Mukti (Salvation). The traditional wisdom of the Hindus is each path is not mutually exclusive and one can pursue many path at the same time. As you will observe in this collection of pages on Hindu Temples, each temple was meticulously constructed according to the traditional Agama and no effort was spared by the Kings in the rich architecture. The deities in the ancient past were made out of gold metal and lavishly embellished with precious stones. This practice eventually became the downfall for many of the temples when the Muslim invaders attacked the temples as much for the wealth of the temples as also for their distaste for the idolatry. Hindus have worshiped in this sacred temple for thousands of years until the Muslim invasion. Several Muslim invaders destroyed the temples only to be rebuilt by the Hindu Kings later starting from 1194 AD to 1669 AD. The original temple was destroyed by Aurangzeb and traces of it can be seen behind the Gyanvapi mosque. The present temple built by Ahalya Bai of Indore in 1776 is situated in the premises of Banaras Hindu University and managed by the Birlas. The Sivalinga, the main deity, is 60 cm tall and 90 cm in circumference and is made of black stone and is housed in an altar made of silver. Located amidst the crowded lanes of Kasi, Vishwanatha temple can be entered from a lane of the same name. Located inside are several smaller shrines along Vishwanatha Galli;.near the Ganga River. These are dedicated to Vishnu, Vinayaka, Saniswar, Virupaksha, Avimukteshwar, Kaalbhairav and Dhandapani. Mangal Arti is from 3 am to 4 am. Bhog Arti is conducted around noon. From 7 pm to 8.30 pm, Sapta Rishi Aarti is done. MahaShivratri is celebrated each year with thousands participating in the ritual bath and puja. Vishwanatha or Vishweshwara means the Ruler of the Universe. According to Hindu philosophy, Kasi is associated with Moksha or salvation. Taking a dip in the holy Ganges is said to cleanse the soul. Tradition holds that a devotee must give up one desire after a pilgrimage to Kashi. On the banks of river are eighty four bathing ghats located and several teerthkundas which is believed to be here since the time of the Vedas. Some of them are Varanasi Ganga Ghat, Kedar Ghat, Tulsi Ghat, Mansarovar Ghat, Dasaswamedh Ghat, Panchaganga Ghat, Manikarnika Ghat, Manmandir Ghat, Dandi Ghat and Harishchandra Ghat. 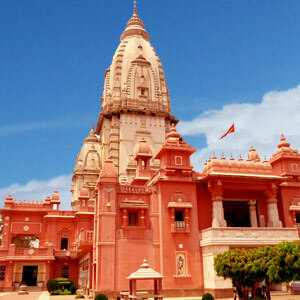 Adi Sankara, Ramakrishna Paramahamsa, Swami Vivekananda, Goswami Tulsidas, Swami Dayananda Saraswati and Gurunanak are said to have visited this temple. Varanasi in Uttar Pradesh (UP) is - 120 km from Allahabad by NH2. Kanpur is UP is about 330 km from Varanasi on the NH 2. Varanasi is well connected to the rest of the country by train and road. The Varanasi railway station is an important rail junction and connects to major cities across India.